As a tree care company, Atlanta Arbor is dedicated to enhancing the health of your trees and keeping you safe. We provide this to you on many different levels. Our most recognized service is from one of our many tree crews that provide tree; pruning, removal and storm cleanup. 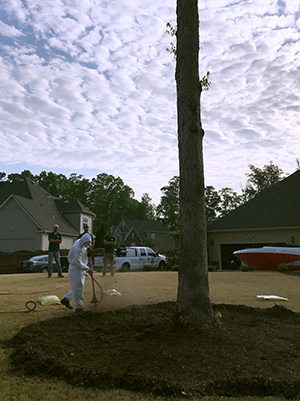 In addition to our tree crews, Atlanta Arbor protects your tree’s health with our Plant Health Care Division’s services. Our Plant Health Care Division utilizes the latest scientific advancements in the tree care industry to help you maintain the beauty of your property. Tree Fertilization: We label this “fertilization” but fertilizer is only the smallest benefit of our product. Standard fertilizers are composed of 3 main nutrients; nitrogen, potassium and phosphorus (NPK). This is a good treatment for lack of macronutrients in the soil. The problem is that fertilizer is just a treatment and treatments need to be administered on a consistent basis. We are striving to provide the solution to the lack of micronutrients in your soil. Our “fertilizer” blend is composed of not only standard NPK fertilizers but it also contains; humic and amino acids, root vitamins, beneficial bacteria, sea kelp extract and mycorrhizae. This combination works symbiotically to help change the composition of your soil. Changing the composition of your soil provides the best habitat for your trees roots. Growth Regulators: This is a phenomenal product that can help trees in many different ways. A Growth Regulator reduces the amount of annual apical growth by up to 70%. A reduction in apical growth helps the tree preserve energy to fight drought stress, insect infestations, and decay. Although the tree slows apical growth, the fiberous root system production doubles aiding in more water and nutrient uptake. Growth Regulators are installed in 3 year cycles, this equals great savings for you. Integrated Pest Management: Integrated pest management is the combination of appropriate pest control tactics into a single plan to reduce pests and their damage to an acceptable threshold levels. We employ Natural, Cultural, Mechanical, and Chemical Control methods to solve your pest problems. Pest management programs are tailored specifically to your trees and shrubs needs, we offer 4,6 and 8 annual site visit packages. Tree Density and Decay Measuring: How do you know if your is hollow or contains heartwood decay? We have the perfect tool to determine this. Our Resistograph measures tree density at various depths. This helps our Arborist’s determine the level of risk your tree poses to you or your property. Trees can sustain from 30-60% decay before they are deemed structurally unstable. This percentage is dependent on tree species, location of decay, and other environmental circumstances.